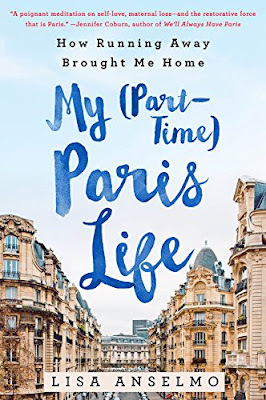 My review today is for My (Part-Time) Paris Life, an open and honest memoir by Lisa Anselmo. Following the death of her mother, Lisa is left feeling lost. This well written book is her journey through childhood memories, feelings and emotions towards finding happiness with her life as it is now. Paris had always been her escape and buying an apartment there becomes her focus. I loved joining her as she got to know her neighbourhood, celebrated life with her Parisian friends and learned how to structure her days in Paris. Her Paris is certainly not tourist Paris, and I liked it so much more for that. There is a real air of sadness every time Ma is mentioned and for every Happy Hour apero in a Parisian café there is a dark place and difficult time that Lisa shares with the reader. My head can also butterfly from one feeling/worry to the next, but nothing quite like hers does. At times it was exhausting and I was glad I was only in her head for the duration of the book, but this very personal reflection gave me a feeling of attachment with Lisa. I enjoyed making the journey with her. If you like reading memoirs not just because of where they are set or the life the author has led, but because they are a window into the heart of the author, you will love this book. I did! My Part-Time Paris Life is published by St Martin’s Press and is currently available in hardback and ebook format.